The abstract world of coding is ideal for people who are blind or have low vision, but to there is a high barrier to entry to getting started, with students first needing to learn to touch type for example. 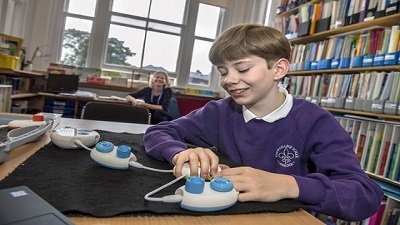 Today at BETT education show, Microsoft announced Code Jumper, a tethered hardware device designed to teach children who are blind or have otherwise impaired vision how to code. Instead of poking at tablet screens or typing into laptops, students are taking out brightly colored plastic pods, connecting them together with thick white wires and then adjusting the pod’s buttons and knobs. These physical components will be used to create computer programs that can tell stories, make music and even crack jokes. “There really isn’t an equivalent to this physical way of programming,” said Jonathan Fogg, head of computing and IT at New College Worcester. The early access to basic coding skills is important, Fogg said, because many kids who are blind or low vision are drawn to careers in computer science. He thinks that’s partly because many of the skills kids with low vision develop to navigate the world make them good at the kind of computational thinking that’s helpful for a computer science career. And, he said, traditionally it has been a career that is more accessible to people who are blind or have low vision, because of tools such as screen readers. “This is an opportunity for thousands of people to have meaningful and well-paying jobs,” said Larry Skutchan, director of technology and product research for APH.